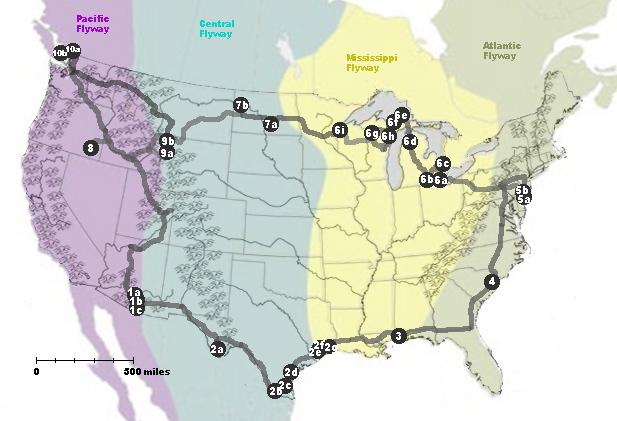 14,908 mile road trip through several birding hotspots of the Lower 48. A birding trip of a lifetime. Green Jay on my Subaru in the Lower Rio Grande Valley of Texas. After acquiring a Canon Telephoto EF 400mm f/5.6L USM Lens in 2006, I became fascinated with birds. Each species boasted a different plumage, song, and quirky personality. I soon discovered that there were many more kinds of birds than I would ever hope to see near Vancouver, British Columbia. I began dreaming of a trip across the country to find all the other unique bird species living across North America. In Spring 2008, I put my dream into action. First, I quit my second job as a junior civil engineer. (This time I had lasted 7 months, one month less than my first failed attempt the previous year, when I had quit and embarked on an amazing month-long climbing road trip to Red Rocks, Yosemite, and the Rockies). I was beginning to think cubicle life wasn't for me. In a state of bliss over my recaptured freedom, I threw my sleeping bag and camera gear into my Subaru, and set out on the road to pursue the songbirds (and non-songbirds too of course) across the country. The following page outlines this birding trip of a lifetime, which took me on a 14,908-mile round tour through many of the birding hotspots of the Lower 48, from Vancouver to Arizona to Texas to Alabama to South Carolina to New Jersey to the Great Lakes to North Dakota to Oregon to Wyoming and back home. I focused my birding efforts to 10 major birding areas along the way, staying at each area for a few days before driving on to the next. These areas provided a range of habitats, and each area hosted a distinct combination of birds. Of course, the main purpose of this page is to exhibit plenty of PHOTOS of the birds I saw along the way. I tried to get a photo of every kind of bird that I saw at each area, and I often found myself stealthily stalking a robin or house sparrow, just as eager to take it's photo as I would be if it were a Kirtland's warbler or flame-colored tanager. Over the course of my travels I saw at least 370 different kinds of birds, most of which I had never seen before. Prepare to be entertained with photos! At the end of my birding roadtrip, I put together a hardback book (using iPhoto). Click here to download a reduced-size pdf of this book. My trip took me on a round tour through the major birding habitats of the Lower 48, starting and ending at my home near Vancouver, British Columbia and circling 14,908 miles around the country. I focused my birding efforts to 10 major birding sites along the way, staying at each area for a few days before driving on to the next. The numbers on the map correspond to the list of places and links below. 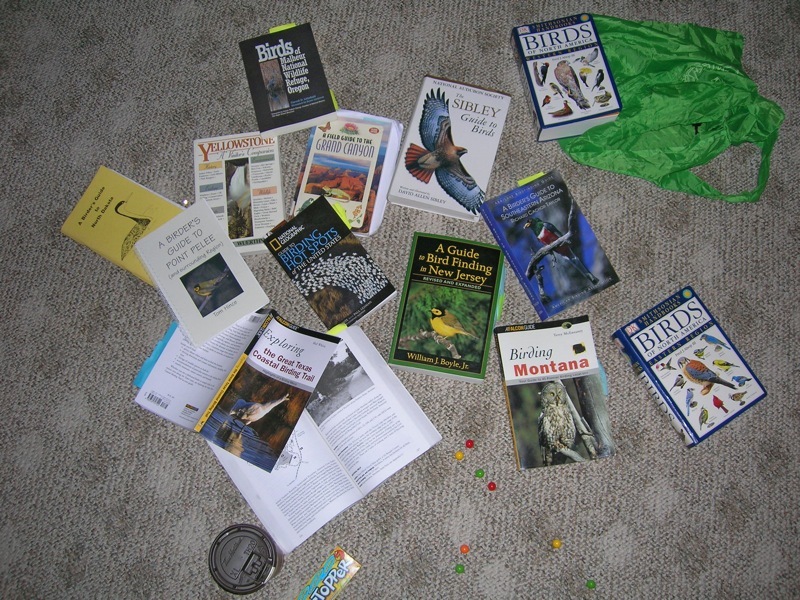 I spent several hours researching the best birding areas across the country that would not only host a large volume of birds, but would also represent the different birding regions of the Lower 48. 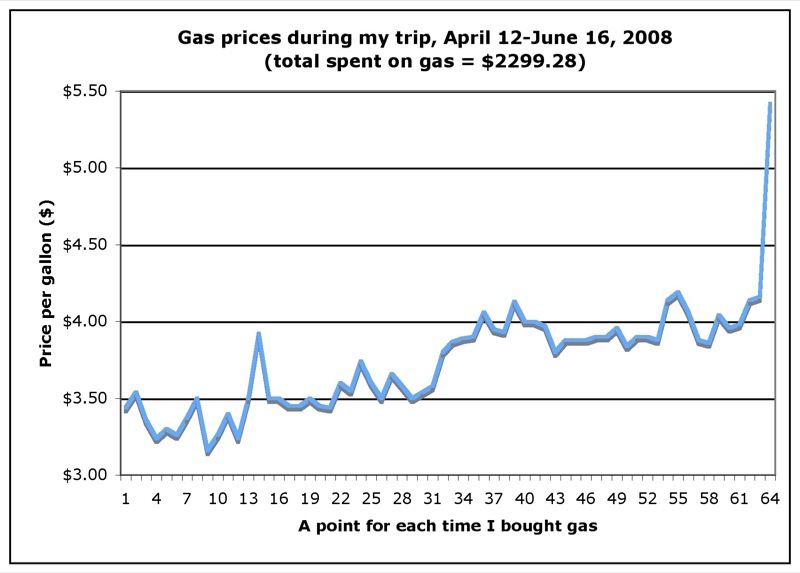 I thought that the increase in gas prices just over the 2 months of my trip was kind of interesting! The trip was well worth the whopping $2299.28 I spent on gas on my 14,908 mile adventure around the country! The spike at the endcorresponds to a tank of gas I bought in Canada near the end of my trip at the equivalent of $5.42/gallon! And we thought the price of gas in States was high! Here is a list of the birds I photographed on my trip, with links to the pages the photos can be found on. I did not see or photograph every bird, but I've tried to give a good sampling of my favorite photos from each region I passed through. Many of the birds I saw in several locations along my travels. Click on the links below to be directed to the pages with the specific bird photos.